This is not a vegan food blog. This is not a vegan lifestyle blog. This is the vegan everything blog. Seriously. There will be food. There will be events. There will be stories. There will be my adopted bun-friend, Pippin. If it is vegan related it has a chance to make this blog. Hope you enjoy the ride! Clockwise from top left: banana chocolate chip mini scone, raspberry danish, chocolate chocolate chip big cookie, pignoli mini cookie (gluten free! ), and a cowgirl cookie sandwich with pink vanilla frosting in the middle. All this vegan awesomeness for $16.50. And they gave me an extra pignoli cookie free, which I did not realize until I got that box home and opened it! You can see that there is only one pignoli cookie in the box... I may have eaten that extra one already! Woops! It was sweet and nutty and delicious. I also took a few bites of that raspberry danish. Holy crap, I could gain a whole lotta weight eating those things. Light, flakey, sweet, delectable baked goodness. 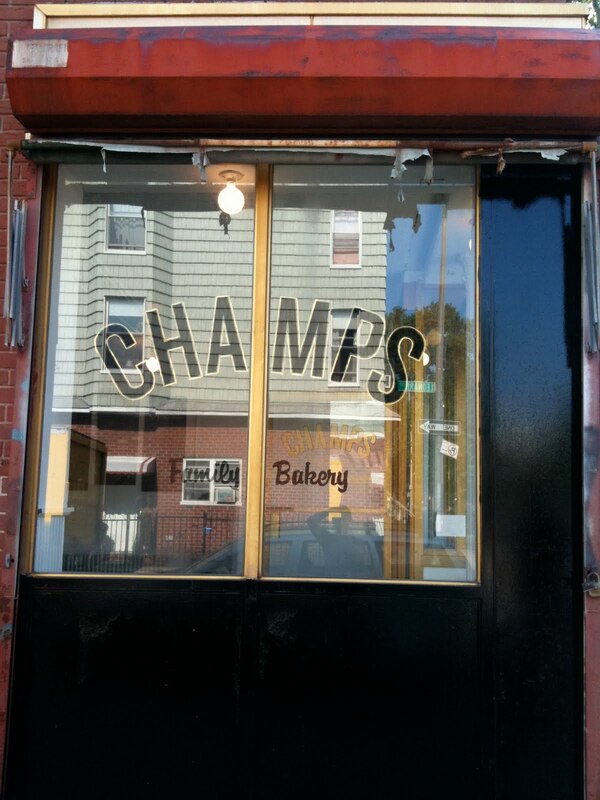 Please go support Champ's! It is three blocks away from the Lorimer L train stop. 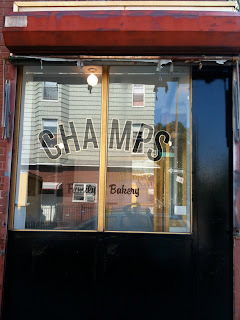 Perhaps Babycakes came first, as NYC's first vegan bakery, but Champ's reminds me of my New York City childhood. They are adding more treats each day! there will be croissants next week, the lovely man behind the counter told me. I will be back for those, let me tell you. Those photos look good enough to eat! I'm glad you and Dan had such a fabulous time. :) Thanks for sharing this yummy post! Hi. My name is MollyG. I live in New York City. Center of the universe (Rent reference). I am vegan (duh). For the animals, for the planet and for my health. I'm a Mechanical Engineer by trade. I think linearly and write that way, too. Blogging is an attempt to fulfill the activist, creative, cultural part of my brain. Also, be on the lookout for Pippin and Luna, my lovable bunnies and DanT, my human animal companion. They are sure to make an appearance or two. HEY LOOK- I MOVED! - I moved to http://cookingforaveganlover.com/ Check out the Lotus Foods giveaway going on right now!